PENTA 725 series is a new generation of compact audio routers from NTP Technology, enabling powerful audio router systems to be built on a modular basis. PENTA 725 has a capacity of 384 x 384 cross points with AES3 and optical MADI interfaces. PENTA 725 is housed in a 1U 19 inch chassis. PENTA 725 is controlled via TCP/IP from the NTP 635-300 controller with NTP client applications like BLISS and VMC, from the well known NTP 625-801 main router or from 3rd party control systems. PENTA 725 series is based on a hardware platform, with an extremely powerful programmable router and DSP processing core, which can handle more than 1000 x 1000 cross points. The PENTA 725 consist of various models, i.e. models suitable as sub-router for the NTP 625 Audio Router system, and models for small and large router systems. 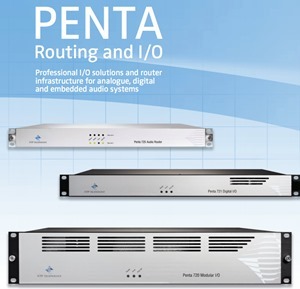 PENTA 725 can be upgraded with extended multiplex- and processing capability as new functionality is released by NTP. The first member of the PENTA 725 series is the PENTA 725-100 Audio Router which can serve as a sub-router for the NTP 625 system. PENTA 725 has 64 AES3 stereo and 4 MADI inputs/outputs for interfacing digital audio sources. 2 high-speed bi-directional links are available for connection to other 625- or PENTA 725 systems. An AES3 monitor output is available for monitoring of inputs and outputs. Supplementary to the remote control via TCP I/P, router settings can be controlled locally using front panel navigation keys. - 64 stereo bidirectional AES3 links on 6 x 50 pin D-sub female connectors.